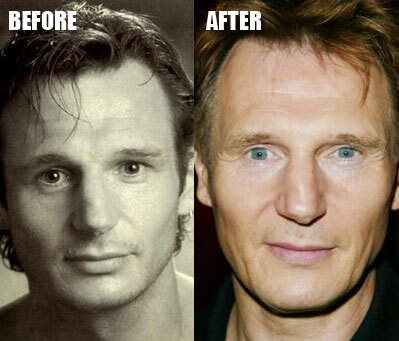 Liam Neeson before and after plastic surgery. Liam Neeson is an outstanding well established Oscar and Golden Globe nominated actor, featured in such movies as Schindler's List, The A-Team and Star Wars Episode I: The Phantom Menace. Liam Neeson has always been known as a rather good looking leading man on the big screen, however like many other aging celebrities, plastic surgery is almost always the method sought for restoring a youthful appearance. Unfortunately plastic surgery usually doesn't go as planned, often resulting in a drastically negative alteration in appearance. And while we aren't throwing Liam Neeson under the botched plastic surgery bus, the tightening of his skin gives him a less than desirable result, which is presumably from either an eye lift or mini face lift operation. I suppose Liam felt he needed a few nips and tucks after enduring a short lived boxing career as a youth. Judging from the before and after photo, do you think Liam Neeson actually went under the knife for plastic surgery and if so, how would you rate his procedure? ok guys same issue with using a photo from years ago & placing it beside a current one? Really do you think thats a fair comparison, 20 to 30 years from now you look @ your before & after pics & tell me .